Best Men's Lip Balm for Men. SPF 30. Unscented. Chapped Lips. This Lip Balm contains an SPF of 30 which prevents sunburn and protects against environmental damage to the delicate lip area. Its non-greasy, invisible appearance allows for it to be reapplied frequently which is a necessity for the lip area as products are worn off easily. Once completely absorbed, apply the TiO2 Sunblock to the face and neck for broad spectrum protection from the sun. Finalize routine by applying the Advanced Lip Protection SPF 30 to moisturize and protect against the damaging rays of the sun. How frequently should I apply the Advanced Lip Protection SPF 30? Does Advanced Lip Protection work in all climates? Does the product contain dyes or coloring? 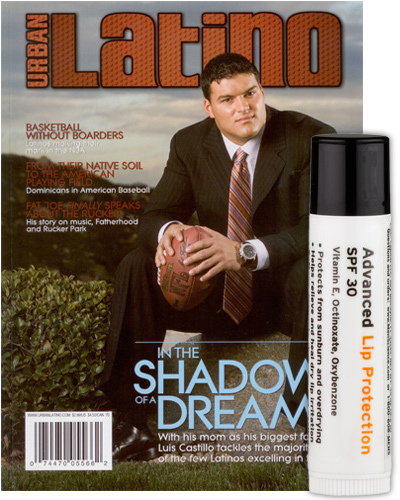 Because the Advanced Lip Protection is non-greasy and has a clear application, it can be reapplied frequently. For maximum sunscreen protection, reapply at least several times during the day and increase the frequency in extreme weather conditions. Because of its advanced formulation, it is designed to help protect the lips from drying, chapping and sunburn in different weather conditions, such as snow, desert, beach, mountain or city. 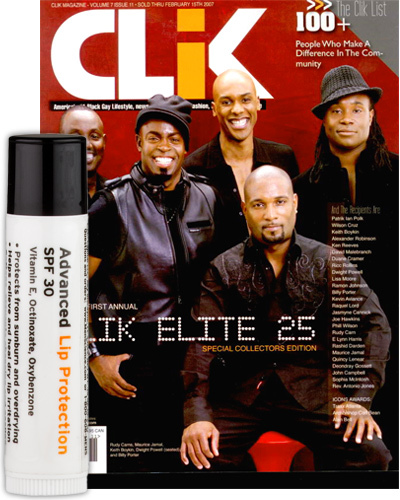 The Advance Lip Protection is completely clear, goes on matte and invisibly and is free of dyes and other irritants. What I like best about the lip balm is that it doesn’t cake on or have a shiny finish. I hate looking like I’m wearing my wife’s lip gloss! This balm protects without the heaviness. I was looking for a new lip balm with strong SPF protection. So I gave Menscience a try. It does a great job of keeping my lips from drying and peeling. I use it at night and wake up without dry lips and use it whenever I go out in the sun. I haven't had it long enough to give the ultimate winter challenge yet. It does have an earthy flavor, but not at all as strong as some reviewers have said, IMHO. I don't notice it after a few minutes either and it's not a bad or foul flavor at all; just kind of earthy. All in all, I'll probably be buying more in time for Winter. I am a big fan of the Menscience line as the products are free from glossy gimmicks and contain ingredients that actually work. However, the Advanced Lip Protection was not at all as expected as it is way to shiny for my taste. For me as a man I would like to add moisture to my lips to prevent them from cracking in a way that doesn't make my lips shine. If that is not something you care about, then this product could be for you, I think however that there are competing products out there that does the job just as well and doesn't add the shine. The balm itself kept lips moistrurized for a longer period of time than most others, but the amount of sunscreen that I could taste after every application was beginning to be annoying. I have yet to try other MenScience products, but this definitely didnt start me off well. This is the best lip bam ever I use it at colorado and my lips always get chap and burn but with this lip balm I dont get chapped nor burned. At 55 I've got the thinning old guy lips that most older men get after 45 but this lip balm keeps them supple and soft. Stays on pretty well and the spf is a good idea for skiing. Great product but inconsistant texture. I've been using this product for over a year and it works great. Unlike some lip protection I've used in the past, this doesn't seem to cause a dependence on the product. I would give it 5 stars but the consistency of the product seems to fluctuate. My first tube was very smooth, but the second one I purchased felt grainy. I don't know if the formula changed or if it was not processed as much. It still worked well, but didn't feel as good. I just placed another order so I hope it will be smooth. Good stuff. Smells like... ? This stuff works really well and keeps lips protected, but the odor is a little odd. It reminds me of something but I can't quite put my finger on it -- be aware that there is a slight odor. I use the the Advanced Lip Protection daily for my dry lips. Its great because no one knows that my lips naturaly get dry and tend to crack. Goes in and stays in for a Long period of time. Heck I even like the light honey bee smell. It is the only one I am not allergic to. I will not buy the advanced lip balm again because when I apply it to my lips it tastes like SPF. I understand that is contains SPF 30, but it doesn't have to taste like it. Sorry, I'm very happy with the other Men's Science products that I have tried, but this one is at the bottom of my list. The best lip protection available! I work 10 hour days, 5 days a week at a local golf course. In the last few years, a chronic problem has developed with my lips that my Dermatologist told me is borderline precancerous. I was instructed to use lip protection that kept my lips protected from the sun AND kept them moisturized throughout the day. I struggled with the "popular" brands of lip protection that never did what they were touted to do. My lips would still crack and bleed, causing me embarrassment and pain. I then purchased MENSCIENCE ADVANCED LIP PROTECTION and for the first time in three years, my problem with lip protection is not only under control, but my damaged lips are healing! I give full credit to MENSCIENCE and their product ADVANCE LIP PROTECTION. Now, when I work outside, I have complete confidence ADVANCED LIP PROTECTION is providing me with the proper protection I need. 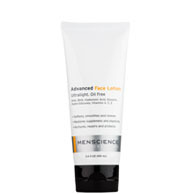 Thank you MENSCIENCE, for a product that works! I must admit that the lip protection was a little bit of a let down for me. Perhaps it is because I am a user of another brand's lip balm. This is the best lip solution I have come across ever. It is greasy and heavy, but just apply some before bed, and then I don't need to worry about my lips getting dry all day long, no re-apply needed during the whole day. Isn't that amazing? I use the product several times a day. Can't live without it! My son lips are always chap. He is 13 years old and doesn't want to have this red chapped mouth anymore. I bought this lip balm in hopes it might help. I have spent hundreds of dollars on balm and etc. trying to help his lips and nothing ever helped but this is doing the job. Thank you. Of all the brands I've tried, this product is the only one I have found that doesn't burn. It also is a great moisturizer. Others feel like wax that just covers your lips. This stuff seems to sink in and actually do something. One day I went to [...] and the person that was helping me told me "I know it says that this is for men but..." and that was it, everyday ever since I have use this product and all I can say is if you don't like extra shiny-smelly-sticky lipsticks this is the one. It feels natural not chemical, again love it! Also known as octyl methoxycinnamate. A powerful sunscreen agent that absorbs UV rays (especially UVB), is non-allergenic and does not dissolve in water. An FDA-approved chemical that absorbs harmful UVA rays and complements other sunscreen agents that shield the skin from harmful sun damage. Important antioxidant to help fight free radicals. Moisturizes the skin and helps reduce the visible signs of aging. Also known as beeswax. Used for centuries to soften skin and restore skin's suppleness. A fragrant herb native to the Mediterranean area. Prized for centuries in skin care for its refreshing and invigorating qualities. Soybean extract contains vitamins A, E and K, and is a non-irritating, natural moisturizer. It contains Vitamin E and beneficial fatty acids that moisturize and hydrate skin. Inactive Ingredients: Helianthus annuus (sunflower) seed oil*, cera alba (beeswax), extra virgin olea europaea (olive) oil*, cannabis sativa (hemp) seed oil*, rosmarinus officinalis (rosemary) leaf extract, tocopherol (vitamin E), aloe barbadensis (aloe vera) oil.